School choice advocates lost a bid this legislative session to channel more public funding to private schools through education savings accounts, a form of vouchers. But a little-known existing program has succeeded at doing that in an indirect way and, while still relatively small, is growing. Taxpayers have received more than $1.4 million in tax credits over two years for donating to a program that gives tuition scholarships to private school students. The Oklahoma Tax Commission issued tax credits of $570,000 in 2013 and $854,000 in 2014 to taxpayers who donated to nonprofit organizations created to channel the money to private preK-12 schools. The nonprofits are known as “scholarship granting organizations,” or SGOs, and were enabled in 2011 by the Oklahoma Equal Opportunity Education Scholarship Program. Tax credits claimed in 2015 are not yet available, but there are signs of further growth. One of the three SGOs in the state, the Opportunity Scholarship Fund, announced in late December that it had received more than $800,000 in donations in 2015, more than three times the amount reported on its 2014 tax return. Among the gifts were two from corporations totaling $300,000, said the organization, which has 48 participating schools. The SGO did not name the corporations. The $1.4 million redirected to private schools in 2014 – most of them religious – still pales in comparison to the $1.8 billion appropriated for public schools this fiscal year. But it was significant enough to spur two legislative proposals this session to kill or suspend the program: Senate Bill 920, which would have ended the program after 2017, and SB 977, which sought a moratorium on a number of tax credits, including this one. Neither bill advanced out of committee. The state is facing a projected $1.3 billion budget shortfall in fiscal 2017. Sometimes called “neovouchers,” the tax credits have drawn fire from critics who say they siphon off public school funding without improving education outcomes or providing a fiscal benefit to the state. Private school scholarship programs have sparked controversy in other states, including Arizona, where the first tax credit scholarship program has ballooned to $140 million a year while enrollment in private schools has actually fallen. Oklahoma’s law includes stipulations intended to limit growth of the program. First, there is a $3.5 million annual cap on total tax credits that the state can award. Credits are worth 50 percent of the donation amount, unless a donor makes a two-year commitment, in which case the credits are worth 75 percent. Tax credits are capped at $1,000 for single filers, $2,000 for married filers and $100,000 for businesses per year. Donors can earmark a school, but not a particular student. Scholarship recipients are limited to those below a certain income, but the threshold is relatively high: three times the limit for free and reduced-price lunch eligibility, or about $134,588 for a family of four and $157,676 for a family of five. Once a student becomes eligible, the student and all of his or her siblings are automatically eligible until high school graduation or they turn 21, whichever comes first. Thus, a family need only qualify once. More than half of the program’s funds were given to students eligible for free and reduced-price lunch programs, said Rob Sellers, executive director of the Opportunity Scholarship Fund. “We are (and will see) an impact of reaching students that now have a choice to attend a private school when they are economically not in a position to do so on their own,” Sellers said. He expects donations to grow as public awareness increases. Taxpayers can use the program to reduce their state income tax liability and, if the credits exceed taxes owed, can be carried over for up to three years. 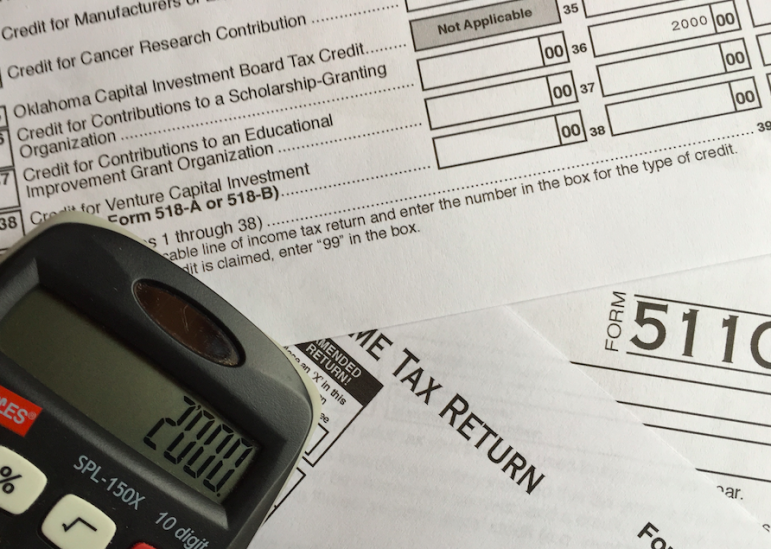 Taxpayers who itemize deductions on their federal tax forms also can deduct donations to the nonprofit SGOs, lowering their tax bill. Another SGO, the Catholic Schools Opportunity Scholarship Fund, which is operated by the Catholic Foundation of Oklahoma, encourages tax-credit donations as a way to promote the Catholic faith. “Today you have the power to pass along the Catholic faith to children who wouldn’t ordinarily have the opportunity, and the power is in your hands,” the foundation’s website states under a “Donate Now” button. According to Guidestar, which tracks nonprofit organizations nationwide, the Catholic scholarship fund in Oklahoma is a religious organization and does not have to file a nonprofit tax return with the IRS. GO for Catholic Schools Inc., another SGO, reported donations totaling $283,838 on its 2014 tax return; the fund provides scholarships to students attending one of a dozen Catholic schools in the Tulsa area. Just over 30,000 K-12 students in Oklahoma attended a private school in 2011-2012, the latest year for which survey data is available from the National Center for Education Statistics. The survey showed an overall national decline in private school enrollment over a decade, particularly at Catholic schools. Nearly 1,200 taxpayers claimed the credit in 2014, state records show. More than a third of those, or about 450, received credits of $100 or less; that was more than the number who claimed the full amount. SGOs gave scholarships to 904 Oklahoma students in the 2015-2016 school year; scholarships averaged $1,129, according to the Friedman Foundation, an Indianapolis-based group that promotes school choice. Tax credit programs are one of several initiatives being pushed by school choice proponents. Education savings accounts, which would allow parents to redirect per-pupil funding to private schools, drew a strong endorsement from Gov. Mary Fallin this year, but the program was rejected by the Legislature. Across Oklahoma, an apparently growing number of parents, community leaders, educators and other residents are raising louder voices about what they view as a crisis in common education.